Partners in Crime is a novella of 19500 words. This story is a digital premiere and has never been published previously. This story is part of the Shattered Empire saga, a series of more or less loosely connected novellas about the great rebellion against the Fifth Human Empire told from the POVs of the people who fought it. 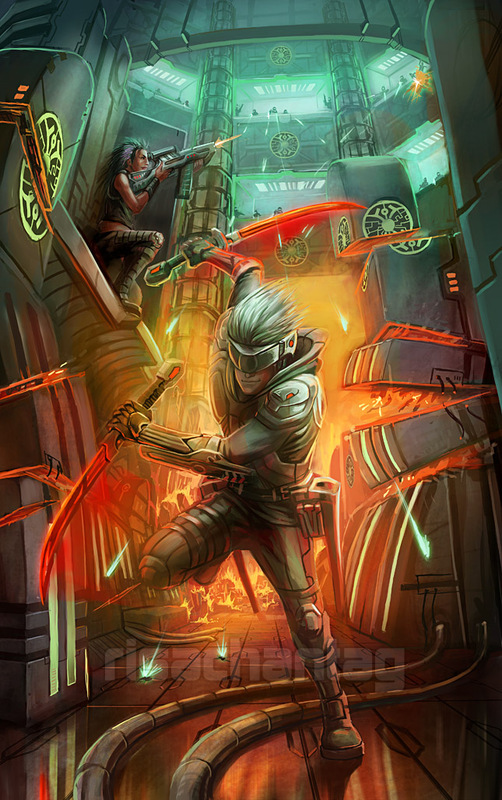 The initial inspiration for Partners in Crime was this piece of science fiction art from the Netrunner collectible card game I saw on Pinterest. The characters don’t look at all like I envision Ethan and Holly and the whole Cyberpunk look is rather dated like a paperback cover from the 1980s or early 1990s. Nonetheless, I saw the picture and suddenly imagined a vivid scene of Ethan and Holly breaking into some kind of heavily secured facility. So I wondered what facility they might break into and pretty much the first answer that came to mind was “a bank”. After all, the Rebellion certainly needs money. After having Ethan and Holly break into the vault and its computers, I was somewhat at a loss regarding how to get them out again, considering that the guards and therefore the bank’s security system were aware of their intrusion since that fight in the stairwell. But then Director Lowe and the Premier Imperial Bank of Houshou‘s rather unique idea of customer service appeared on the scene. Considering that I was not quite comfortable with the violence of the stairwell fight (and my own discomfort is mirrored in Ethan’s feeling about maiming or killing guards who were just doing their jobs after all), I was happy to find a non-violent solution to the issue. Because more conflicts in SFF should be resolved by talking. In a case of too close for comfort, the HSBC scandal broke while I was editing Partners in Crime. The parallels between the real life scandal and the novella are really quite striking, even if the HSBC hacker stole customer data rather than money. What is more, the scandal also proves that there are people like Director Lowe out there in the real world. Coincidentally, at around the time I was writing Partners in Crime I also had trouble with my own bank and found myself wishing for Director Lowe and his unique brand of customer service. Even if he is rather unscrupulous. Even though Ethan Summerton has been playing a prominent role in three of four Shattered Empire stories to date, Partners in Crime is the first story where we actually get to see his point of view. It’s also the first Shattered Empire story with a male point of view character. Coincidentally, it’s also the first Shattered Empire story to have two point of view characters, Ethan and Roy Cheng. For someone who’s been dead since before the series began, Ethan’s father sure pops up a lot, usually in recorded messages of some kind. You will also eventually meet Jonathan Summerton in the living flesh in a prequel story I’ve got planned. Perceptive readers will also have noticed that Ethan briefly thinks about an aristocratic lady he was supposed to marry. You’ll be hearing more about that in future installments and even get to meet the lady in question, too. So what’s the connection between Director Lowe and Arthur Madden? You’ll find out… eventually. The cover image is digital art by the amazing Angela Harburn.